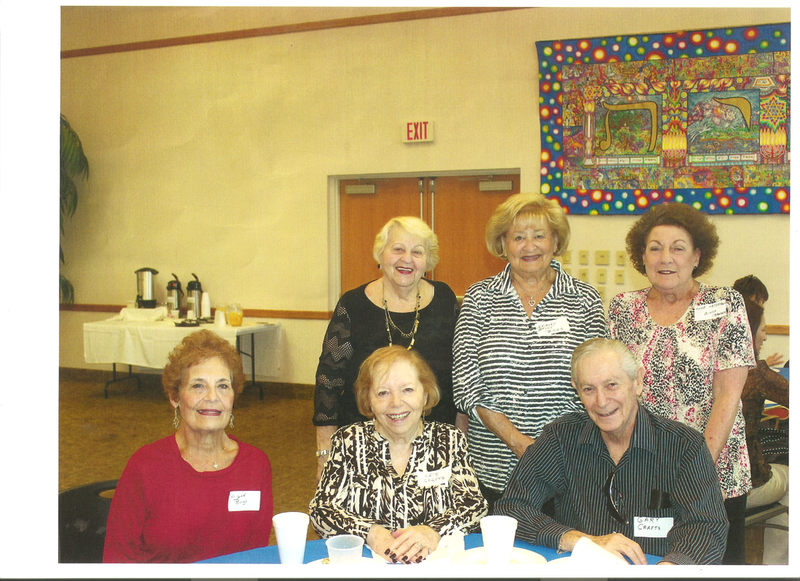 Here are chapter members Ellie Mero and Arlyne Sternburg helping out at a JARC bingo day. 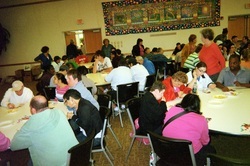 They say, "It is so gratifying and rewarding and such fun to spend the day helping out in this way." 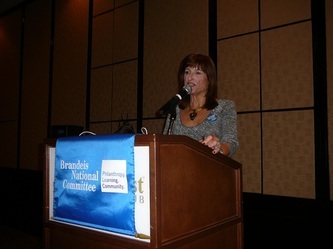 Many thanks to Anne Nathanson who arranges the day and to all the other chapter members who volunteered their time and energy to help make this a successful and rewarding day for all! 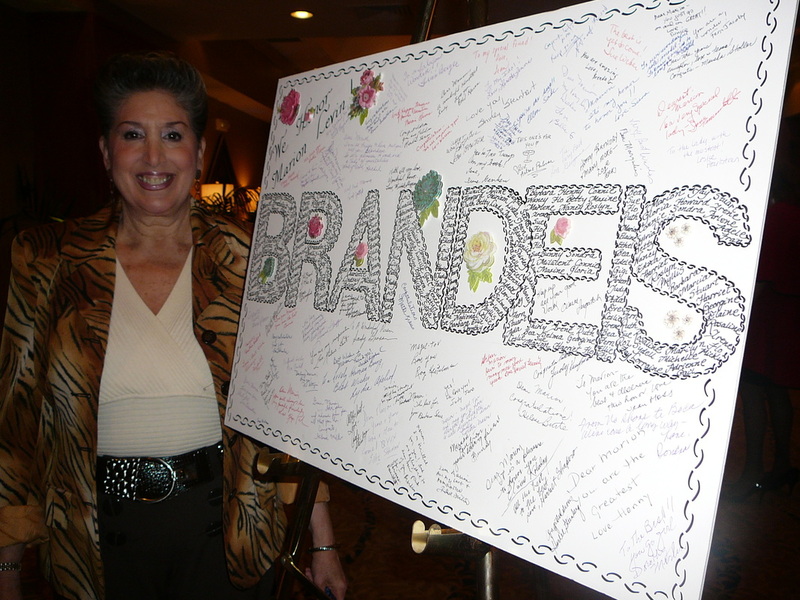 Below are Photos from Breakfast With Brandeis - Oct. 28, 2013. 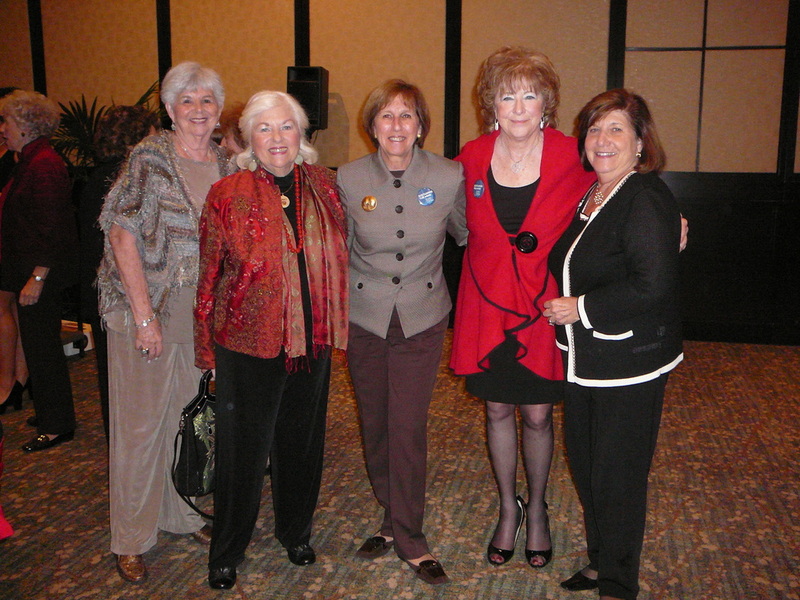 Many thanks to Denie Kane. our photographer and to the Faulk Center for a fascinating program. At Boca Greens Country Club, the new slate of officers and directors of the Boca Raton chapter was installed as the previous officers were decommisioned. Carole Agud, is the new President. Carol Benjamin, President 2011-2012 accepted a gift from members of the chapter board. 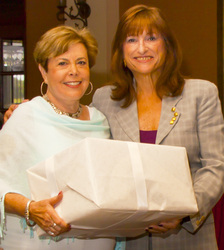 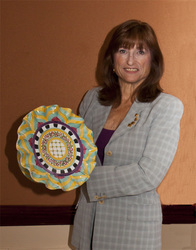 The gift was presented by Carole Steinberg. 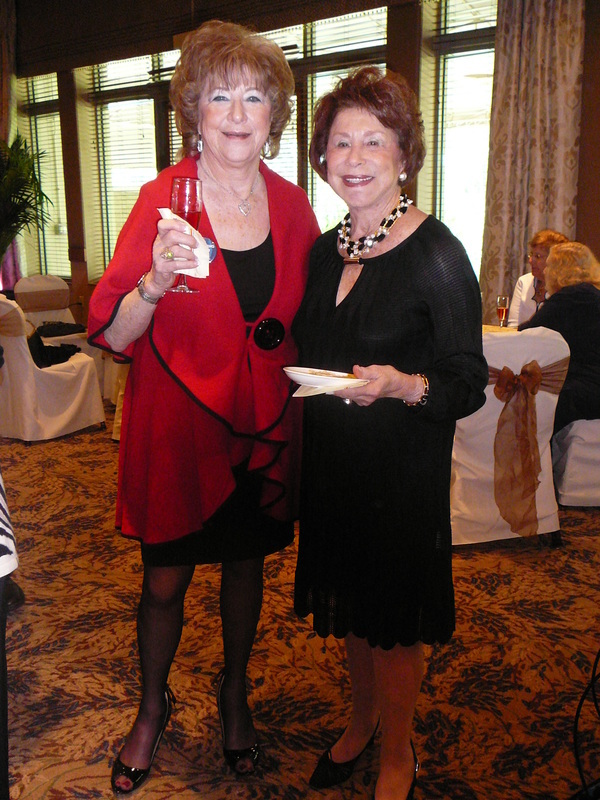 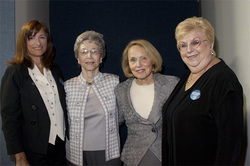 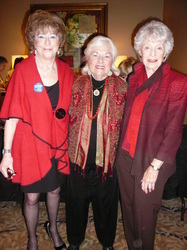 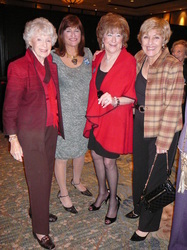 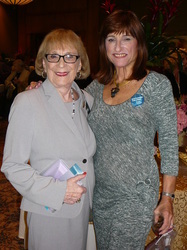 Carole Steinberg and Harriet Lenowitz organized the installation ceremonies. Dr. Dottie Pierce installed the officers. Ruth Kirschner delivered the invocation. Breakfast with Brandeis - March 26, 2012. 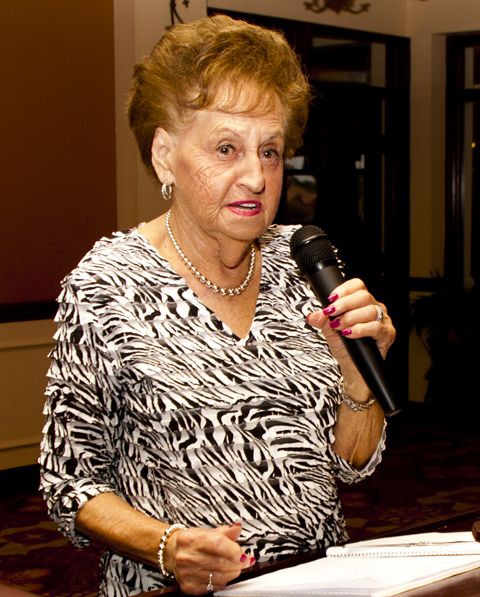 133 people were entranced by Gloria Schusterman's stories about her father, Eddie Jacobson and his relationship with his dear friend and business partner, Harry Truman. 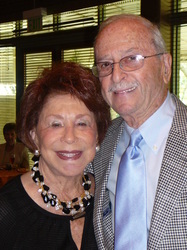 Eddie convinced Harry Truman to meet with Chaim Weitzman who persuaded Truman to have the USA be the first nation in the world to recognize the state of Israel. 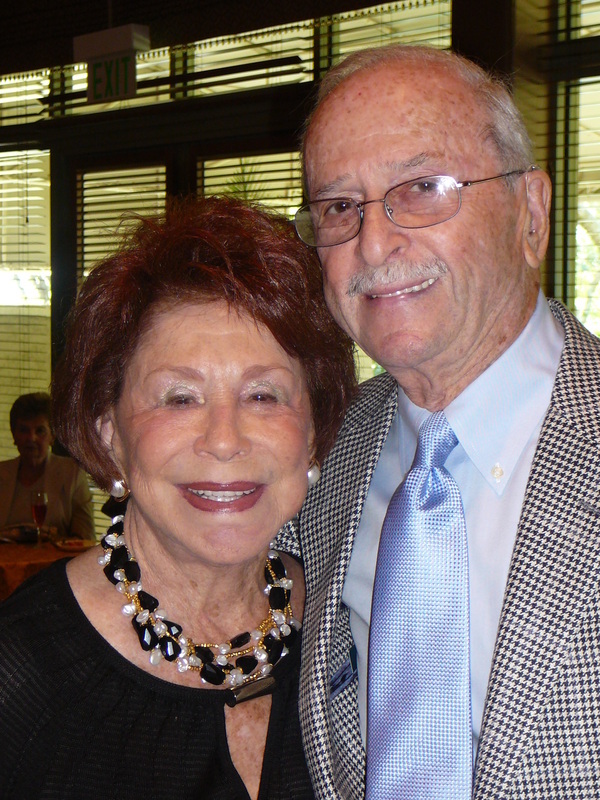 The State of Israel owes a debt of gratitude to Eddie Jacobson. 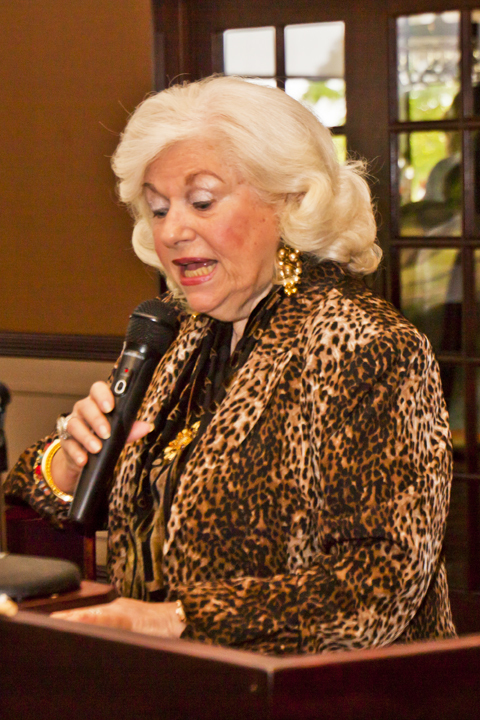 Many thanks to Ruth Kirschner, former chapter President and current Vice President, Public Image for arranging to have Gloria speak to our chapter. And many thanks to Carole Steinberg and her hospitality committee for organizing the Breakfast. 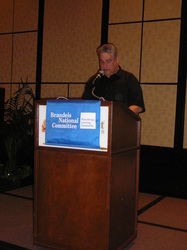 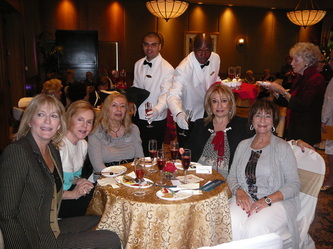 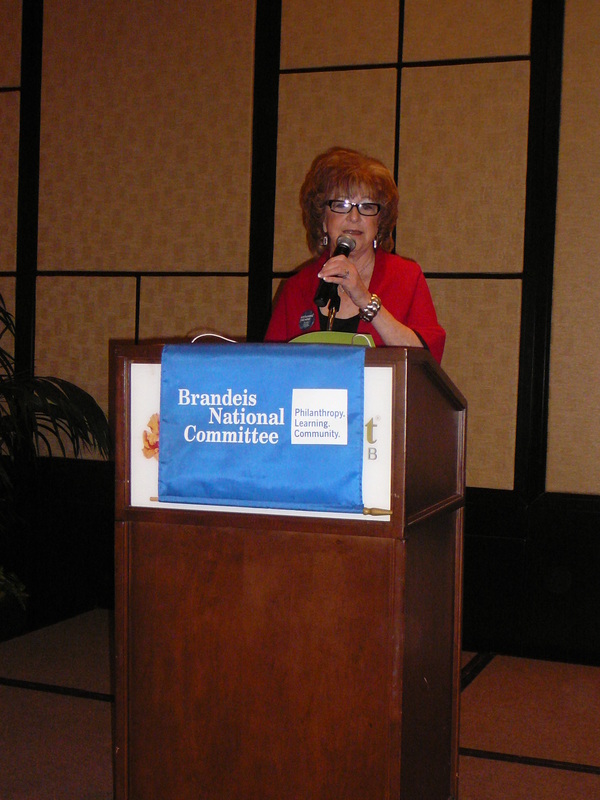 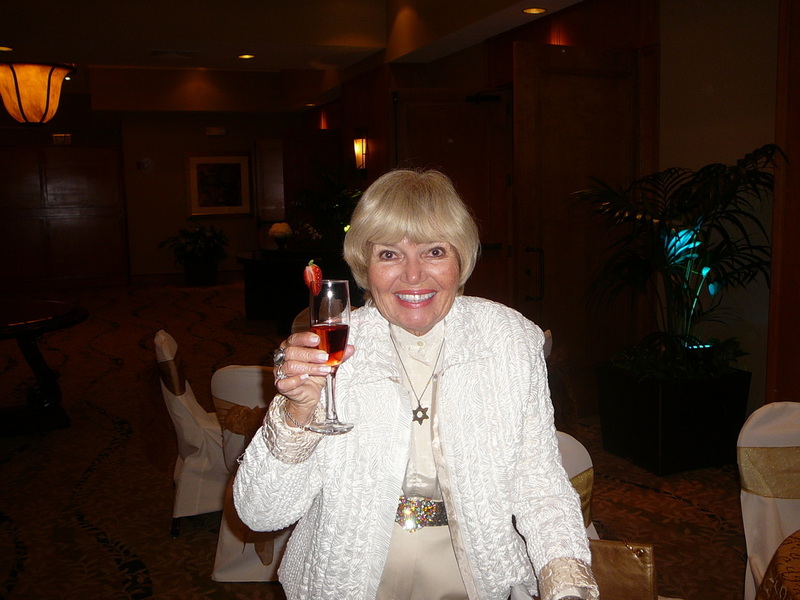 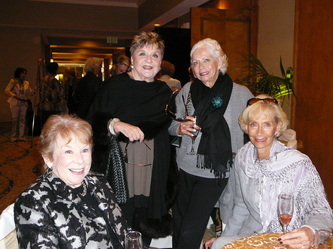 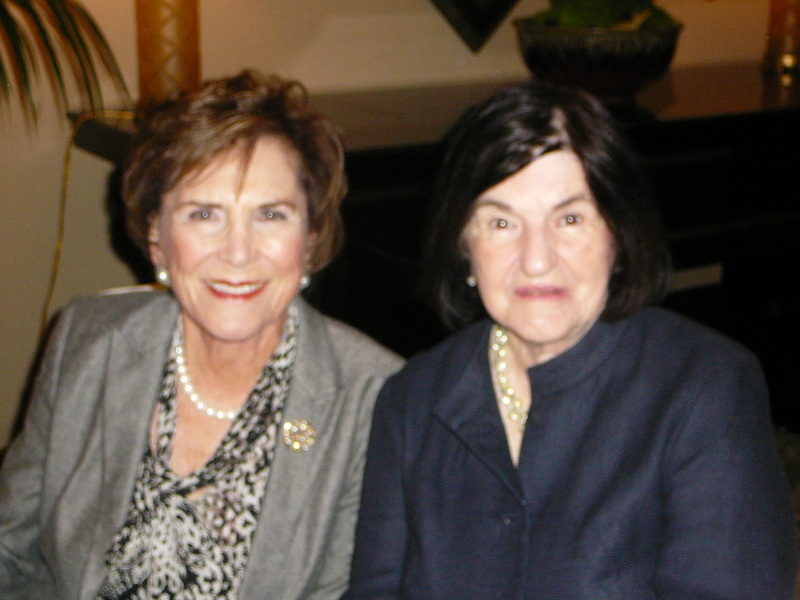 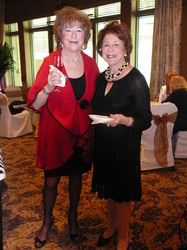 On February 13, 2012, Marion Levin was honored by the Boca Raton BNC chapter at a Tribute Luncheon at Boca West Country Club which raised more than $35,000 for neurodegenerative disease and neuroscience research at Brandeis University. 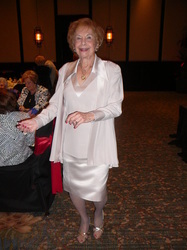 Marion has dedicated more than 42 years of volunteer service to BNC, serving as a mentor and inspiration to many, many members throughout the U.S.A. CONGRATULATIONS MARION!! Click once on a photo above to enlarge it. 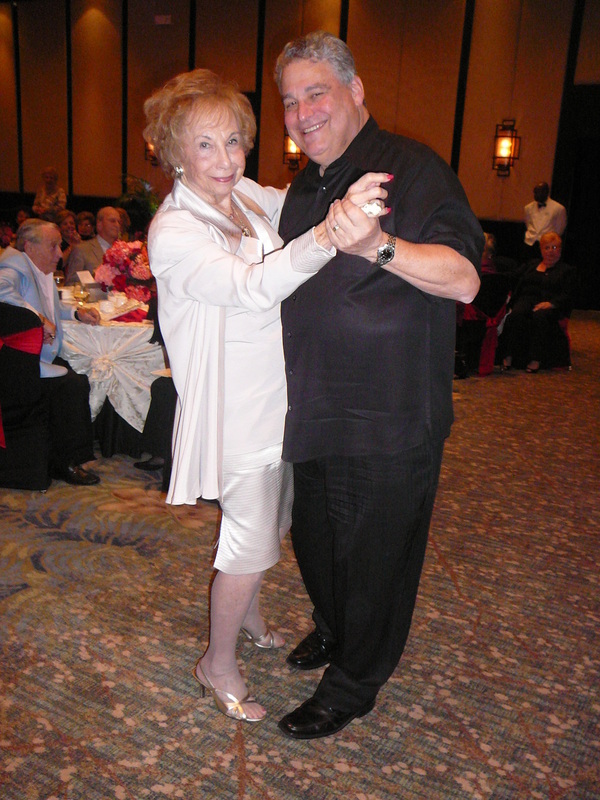 125 friends and colleagues cheered as Marion was celebrated with song and dance by entertainer Jeanne Lynn Gray and danced with her son Stuart Levin. 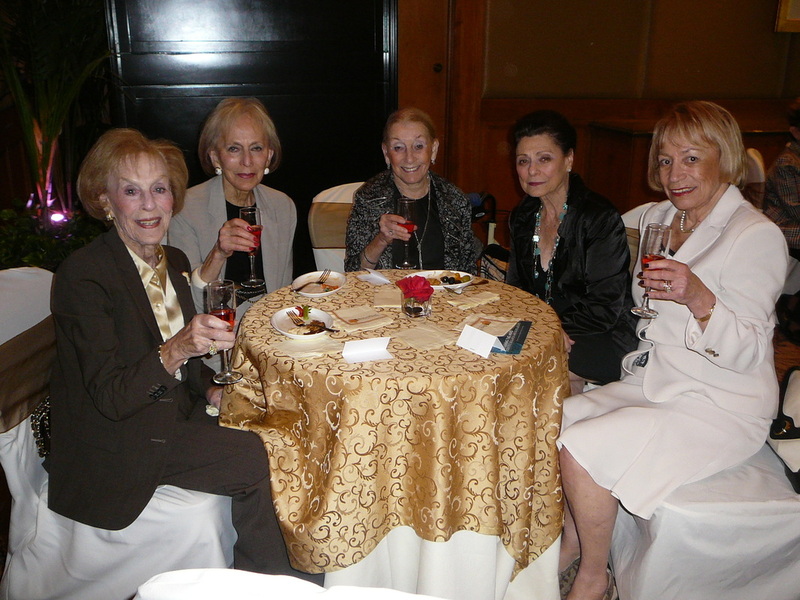 Proceeds were dedicated to "Sustaining the Mind: Scientific Research and Scholarship", a BNC fund-raising campaign that supports neurodegenerative disease and neuroscience research. 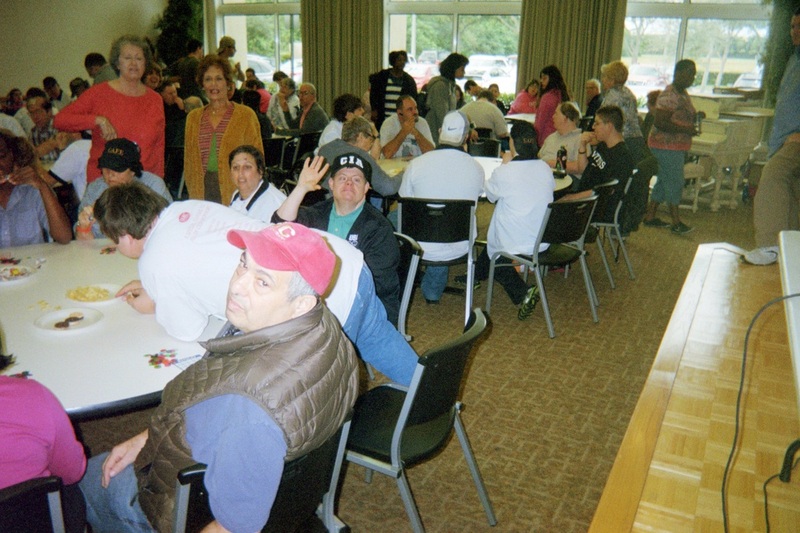 Brandeis professors in more than 50 laboratories are working to discover how the brain works, and to find the causes of and cures for diseases like Parkinson's, Alzheimer's and A.L.S. 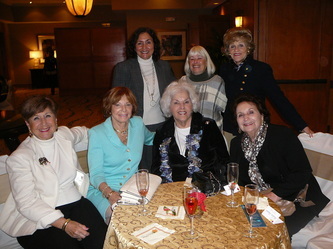 Kudos to Fran Ritter and her committee who arranged a beautiful and memorable afternoon filled with affection and warmth. 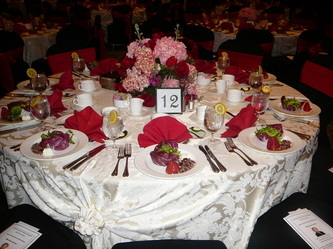 The room was done in Valentine's Day colors, the centerpieces were magnificent, and the food delicious. Chapter president Carol Benjamin welcomed the guests which included many BNC dignitaries. 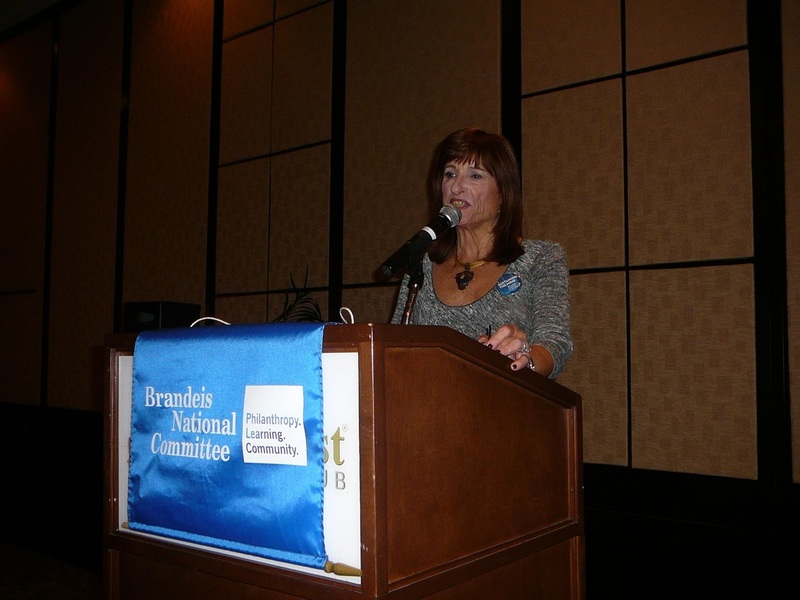 Current National President Leslie Pearlstein presented her remarks and those of Executive Director Janice Fineman who was ill and unable to attend. Stuart Levin, Marion's son spoke of his family's dedication to philanthropy and especially Marion's dedication to Brandeis. 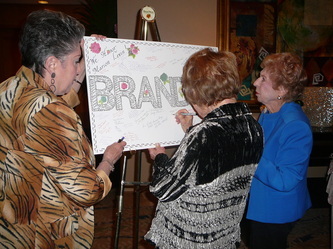 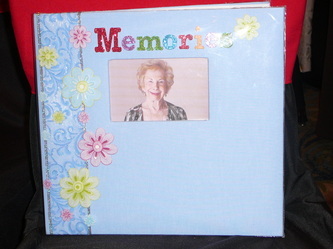 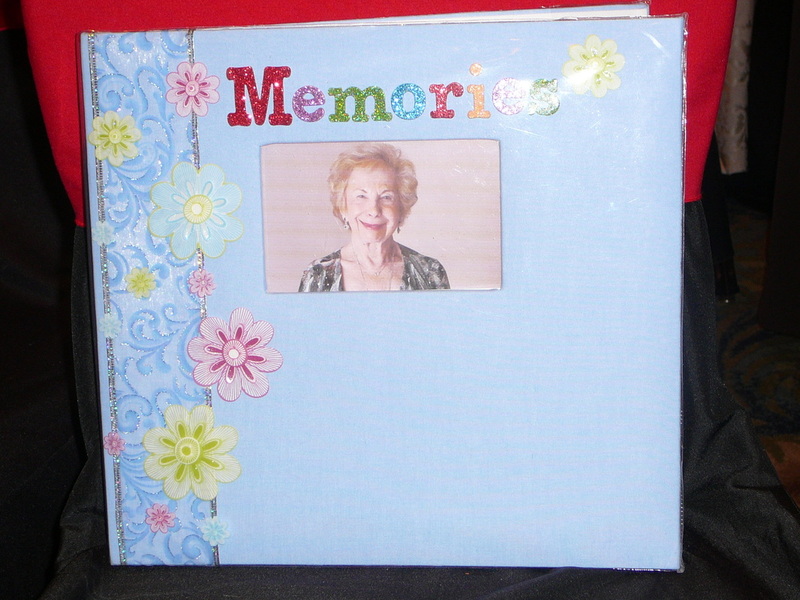 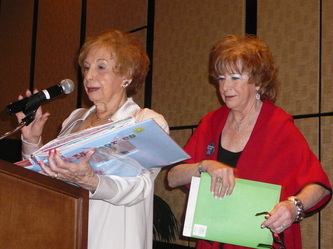 Marion was presented with a memory book containing mementos of her years working with Brandeis National Committee which was lovingly created by Sue Weber and Arlene Ritter. The invocation was delivered by Dena Robbins. Entertainment was provided by Jeanne Lynn Gray, giving Marion an opportunity to dance with her son Stuart, and those in attendance an opportunity to join together in serenade to the tune of New York, New York . 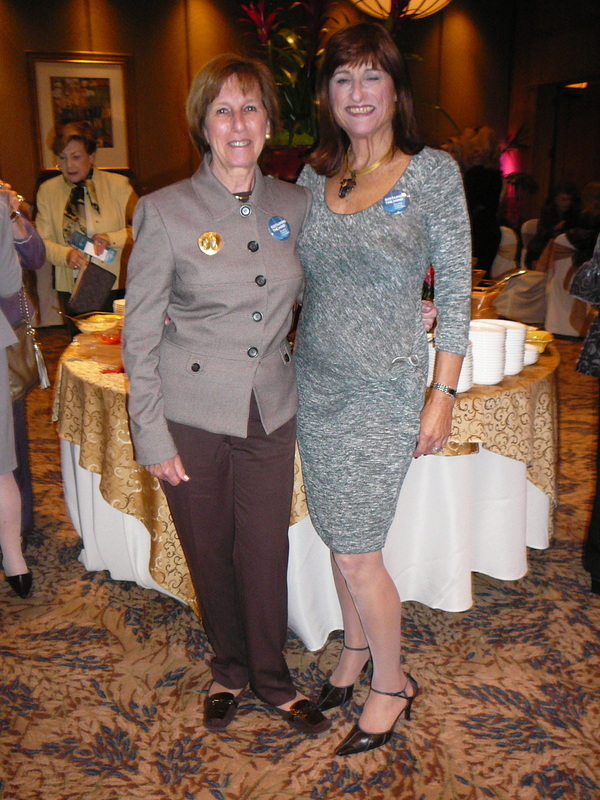 All in all, a wonderful event! On Feb. 1, 2012, the Sun Sentinel Society Scene published a feature article about Marion, the BNC and the upcoming tribute event on Feb. 13. 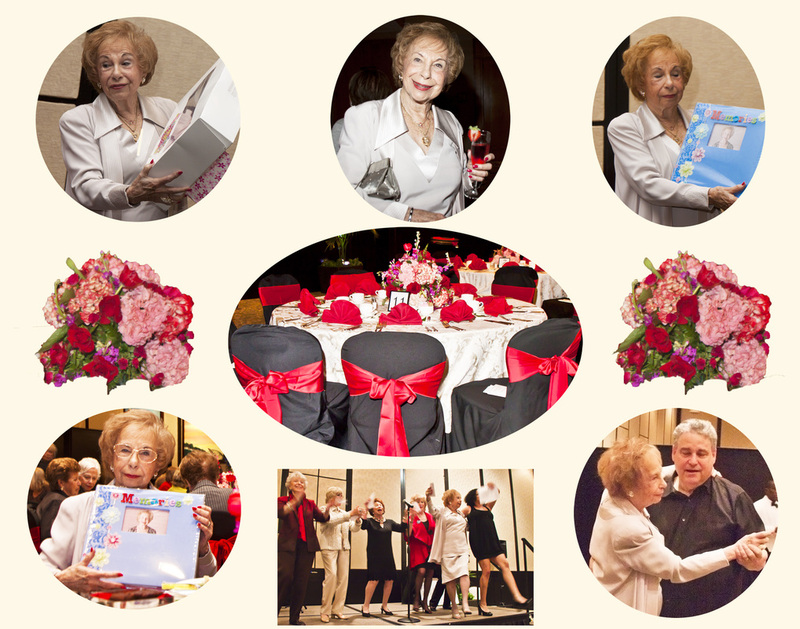 On Feb. 12, 2012, the Brandeis Hoot (On campus student newspaper) featured a lengthy article about Marion and her devotion to Brandeis.